Founded in 2007, LIVETARGET has been rapidly growing, and it’s not hard to see why. They pride themselves on designing realistic lures that are crafted perfectly to imitate real fish. They have a gigantic selection of lures across just about every category - jerk baits, floaters, crank baits, swimmers, divers, drop-baits, you name it. Their quality is unmatched if you’re looking for a realistic lure. It’s no wonder that LIVETARGET has gotten a huge variety of pros and fishing personalities to use their product, including David Walker, Stephen Browning, and Patrick Campeau, among others. Their design philosophy is a simple as it is complex. Fish will respond best to lures that look exactly like what they eat. This may seem like a simple goal. But the complexity factor is amplified when you try to create a lure that doesn’t just look sort of like a specific bait fish. It needs to be a perfect imitation. Many LIVE TARGET lures are nearly indistinguishable at first glance. But their designers are dedicated to their craft, and they’ve created some of the best ultra-realistic lures on the market right now. 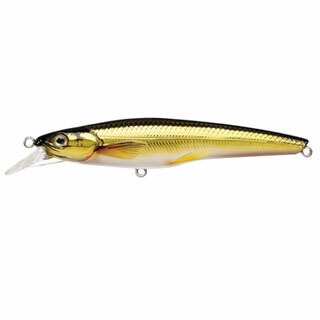 LIVETARGET offers over 750 models of lures. So, it may seem daunting to try and pick the best ones. If you’re interested in LIVETARGET lures, but not quite sure where to start. in your journey of experimenting with ultra-realistic lures, we’ve put together a shortlist of some of our favorite LIVETARGET lures, useful in dozens of different fishing applications. 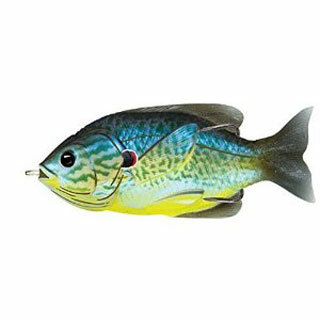 LIVETARGET Yearling Baitball Rattlebait 3"
This LIVETARGET sunfish lure has been crafted with a hollow body, replicating the appearance of a juvenile sunfish that’s been pushed to the surface by other predatory animals. It’s made with a weedless design that lets you use it even in areas that are covered with surface weeds and debris – no need to worry about it getting stuck on anything. It also comes in a tremendous variety of colors and varieties, meaning you can always “Match-the-Hatch,” which is LIVETARGET’s term describing selecting the perfect baitfish for the fish that you’re trying to catch. This model weighs in at 5/8ths of an ounce, and is 3.5” long, and the lightweight and streamlined design make it easy to “walk” around the surface of the water, either slowly to create a lazy loop, or quickly to kick up a bubble trail that’s sure to attract your quarry. 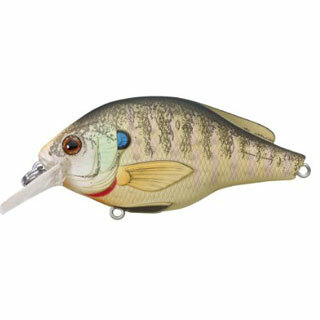 This crankbait is specifically designed to imitate a tightly-packed small school of baitfish, and it’s lipless, making it perfect for shallower waters and weedflats, where you can quickly toss it out and reel it in, making use of its rattling action and naturally-swimming presentation. The rattle is subtle, yet loud enough to bring in fish from a large distance. 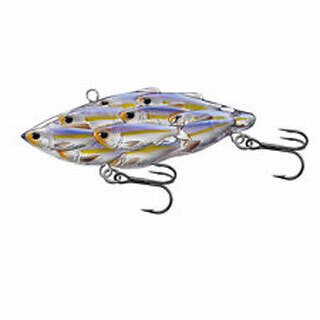 When falling, it presents with a nose-down shimmy that imitates a wounded or confused baitfish, and this crankbait can perform at varying speeds. Presentation ranges from a more subtle wiggle at low speeds, ideal for fishing around rocks and weeds, to a more horizontal, quick side-to-side action that presents itself when you’re really trying to haul it in. It’s versatile and durable, with some users reporting only a few surface scratches after hauling in as many as 30 fish with this lure. Overall a great choice for shallows and other places where you don’t want a deep diver, the rattle, presentation, and realistic design of this crankbait really reels ‘em in. If you’re looking for more a diver for your crankbait, this LIVETARGET Bluegill is perfect for you. The natural shape and precision tooling creates the ultra-realistic look that LIVETARGET is famous for, and the durable lip helps you dive quickly to your desired depths. This particular model is best suited to target fish from ¾ to 4lbs and can be purchased in a natural colorway, or a more flashy metallic scheme if you’re looking to draw in prey from long distances. All this is combined with a rattle that’s subtle yet far-reaching, and mimics the sound of a frightened Bluegill running frantically from a larger predator. While you can use this crankbait just as you would any crankbait in your tackle box, we find that it best fished quickly, speedily, and with an unpredictable jerking motion – cast it out long and hard, let it fall to your desired depth (depending on your rig) and then begin reeling it in slowly, then quickly, then give it some quick jerks while pulling in hard. The rattle, presentation, and ultra-realistic design of this lure will do the rest. This jerkbait can be thought of as a silent, more subtle alternative to the LIVETARGET Baitball Crankbait. It has no internal rattle and is designed to be sleek and subtle, with a realistic design imitating a school of small baitfish. It’s designed to stick to the surface and comes in a multitude of colors and designs, so you can always find the right one for the situation at hand. When topwater fishing is good, this is the bait you’ll want to turn to. Often, we find that fish will strike this jerkbait right after it hits the water, and even if they don’t, a flurry of quick jerks will perfectly imitate a pack of scared, wounded baitfish, and are sure to attract predators. In addition to thetopwater suspension, where this lure excels, it can be rigged to sit slightly lower in the water, given its sizeable lip, if topwater fishing is doing you no good and you don’t want to switch lures. This versatility means it merits a spot in just about any angler’s tackle box. If you’re doing some good-old-fashioned swamp fishin’, this is the lure for you. Totally hollow, and with a realistic design that perfectly imitates a frog, this realistic, weedless lure sits perfectly on top of waters that are totally choked out with weeds and lily pads, or other debris. It's realistic silhouette helps attract prey, and the weedless design ensures that it’ll never get stuck, even in the most crowded of areas, and the soft material used to craft this lure ensures that, after the fish bites, it’ll get snagged by one of the two incredibly sharp hooks that are revealed as it’s compressed. 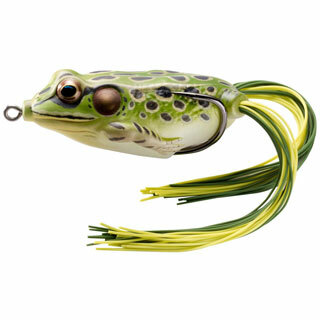 Fishing with this lure is relatively straightforward, but after you get a strike, you’ll want to wait a couple seconds so that the razor-sharp hooks are exposed once this little frog gets chomped – otherwise, you risk losing your catch. Though it’s certainly more specialized than the other lures on our list, this is an incredible utility lure perfect for swamps and choked up creeks and lakes where you risk losing sub-surface lures to weeds. 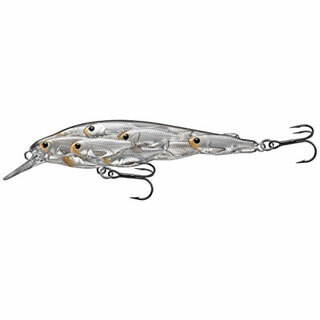 This Blueback Herring Swimbait combines LIVETARGET’s ultra-realistic designs with a three-segmented design that imitates the motions of a real baitfish. They’re available in multiple lengths and colorways, and their subtle presentation drives fish crazy. In addition to subtle balls that create a vibration and sound that attracts fish, the body sections of this fish tend to knock against each other as they flutter in the water, creating even more sound that draws predators in from far and wide. The moderate-sinking version of this lure tends to sink at about 1’ per second, making it suitable for mid-depth fishing, while a heavier, faster-falling version is available with a heavily weighted head, which is more suitable if you’re looking for a heavier, deeper, longer lure with which to catch larger fish. Last but certainly not least is one of LIVETARGET’s best stickbaits, and arguably one of the best stickbaits/jerkbaits on the market. 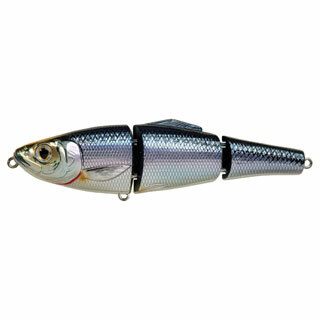 This shiny little lure is designed with subtlety and responsiveness in mind, which makes it a great stickbait. A variety of color schemes flash to bring in fish from far and wide. The realistic silhouette stays oriented correctly in the water. The neutral buoyancy construction lets you sit it either on the surface of the water. Or weight it to slightly below the surface, and the lip design helps you dive a little deeper if you wish. The responsiveness is where it really shines. The subtlest rod motions will produce whip-fast reactions from this jerkbait, and the interior design creates deep knocks that will attract your prey from great distances. It’s certainly not a jerk bait for beginners, but once you start to get a feel for the quick reactions and great control that this lure offers, you’ll never want to go back to cheaper stick baits or jerk baits again. This isn’t a full list of LIVETARGET’s offerings, but it’s a great example of their diverse offerings, covering freshwater, saltwater, and more specialized lure types. The ultra-realistic lure market is only growing, and LIVETARGET is at the forefront of the cutting-edge design that helps gives anglers an edge on the competition. So check out these lures. They’re not cheap, but quality design, attention to detail, and unparalleled realism come at a cost. Besides the results speak for themselves. Once you use one of these lures, you’ll never want to go back to cheap bait shop lures again.